Please call the School Office or email administration@pelkhil.edu.bt for details. Our Admissions Committee can be contacted at 17625335. Good quality education with a faculty of stellar teachers, fantastic sports programs and excellent facilities – these are the reasons for joining Pelkhil School! CLASS XI: SCIENCE: 1 section, COMMERCE: 1 sections, ARTS: 2 sections Academic scholarships are available. CONTINUING EDUCATION (CE): 1 section each in Commerce, Arts and Science streams. Candidates for the CE program must have completed the BCSE (X) exam at least TWO years prior to registration for the BHSEC (XII) exam. Admission is confirmed only after the first installment of the term fees are paid. This is the confirmation fee and is non-refundable. According to studies by the Royal Education Council, private primary schools have easily out-performed government primary schools in every academic department. 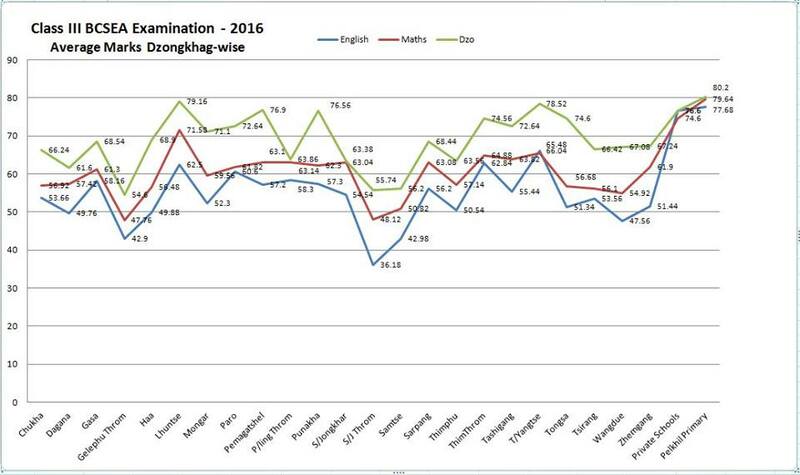 This has been repeated every year in the exams conducted by BCSEA as shown in the table below for Dzongkha, English and Maths. The Pelkhil School Primary Wing students’ did even better! In the common class III common exam, the Pelkhil School students secured an average of 80% against just 59% among government schools. This massive difference in achievement can be explained by the greater amount of attention each of our students receive in our small classrooms. Government schools in Thimphu have 35-55 students in a section against just 15-24 in our classrooms! Year to year the rising standards of our primary students is easily noticeable. With a solid academic foundation secured at Pelkhil School’s Primary Wing, our students will be well prepared for academic success in the higher grades. In addition to excellence in the classrooms, our students are exposed to a wide array of extra-curricular activities that help achieve all round balanced development. We provide supplementary textbooks from the Cambridge International Examinations free of charge in Mathematics, English and Science. We are also the only school to provide Music and Art and HPE as regular subjects (at no extra charge) taught by qualified and experienced teachers. With our qualified and experienced teachers and excellent facilities, you can expect much more from us. We are confident that students entering our Primary Wing will develop a solid academic foundation in preparation for the challenges of middle and higher secondary school. Parents are advised to reserve their seats early as our class sizes will remain small.